Spring Driven Hose Reels Provide Convenient Hose Storage and Access For A Variety of Commercial and Industrial Environments. The adjustable guide arm allows multi-angle floor or wall mounting for location versatility. The shielded stainless steel spring and latch mechanism ensure retraction for years of reliable service. 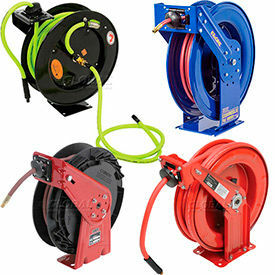 The field-tested swivel is designed to give you full hose access from any area of your jobsite. The reels are made of heavy duty reinforced steel for strength and durability. The powder coat finish improves weather resistance in moist or wet conditions. The lightweight design allows you to easily mount the hose reel for installation ease. 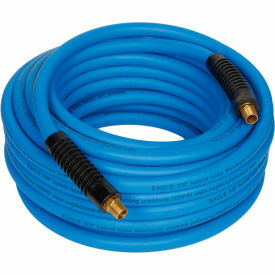 Hose supports both air and water for application versatility. Dimensions vary per model. Air Hoses come in a variety of lengths, widths, and pressure capacities to suit a wide range of compressed-air applications. Hose assemblies are available from several trusted brand names. 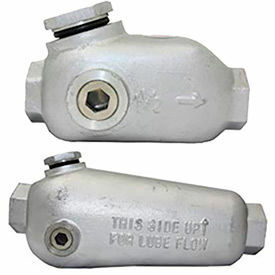 In-line Oilers Are Used For Supplying Oil To Air Tools For Continued Efficient Operation Of Tools. In-line Oilers are made of steel for long lasting durability. Keeps air tools lubricated continuously for longer life and better performance. Provides less down time and more convenience. Pressure tested and built to last. Metering valve guaranteed for life, never to fail. Types are #0 In Line Oiler 1.4 oz Capacity, #1 In line Oiler 4.0 oz Capacity, #2 In Line Oiler 11 oz Capacity, #3 In Line Oiler 16 oz Capacity and In-line Oiler. Capacities are 1.4 oz, 4.0 oz, 11 oz and 16 oz. Dimensions vary per type. Recoil Air Hose Is Designed For Airflow Based Applications Including Automotive, Industrial, and more. 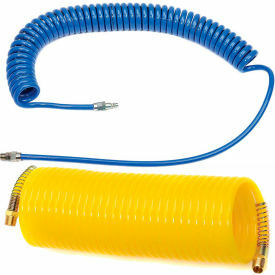 Recoil air hose provides consistent airflow to air-operated tools in need of sufficient pressure. Unit stretches and recoils for self-storing efficiency. Surface shell provides resistance to oils, solvents, and other solutions. Light and flexible design allows ease of handling and transport from one location to another. Specifications vary per model.